Successfully Added 4 Channel NVR Kit - 4 Wireless 720P Cameras, Motion Detection, Night Vision, 3TB HDD Support, Android + iOS Support to your Shopping Cart. Feel safe and secure and keep an eye on your property when away with the compact 4 channel NVR kit coming with wireless 720P cameras, motion detection, night vision, email notifications and more. 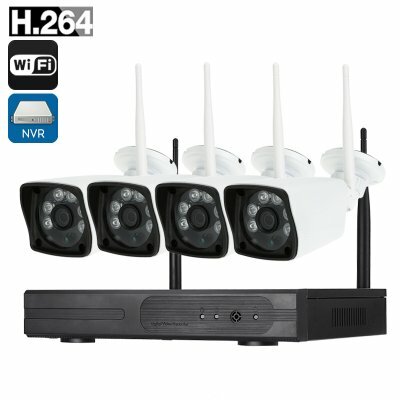 This 4 channel NVR kit will serve as a reliable protector of your property so that you can have peace of mind even when thousands of miles away. Perfect for a household, storage area or a small office, it will provide you with clear and stable video feedback day and night. The NVR kit includes 4 wireless cameras with 720P resolution at 25 frames per second. With the support of 4 motion detection areas, you will be instantly alerted to any suspicious activity and a snapshot of the unexpected visitor will be sent right to your email. Each of the 4 cameras come with 20-30 meter night vision, so you will be able to have a clear view of your property even at night. The system is easy to set up and comes with all the needed accessories. Using it is a piece of cake as well, thanks to the support of both Android and iOS platforms — simply download the dedicated app ad you can access the system direct from your smartphone or tablet PC. The system features H.264 encoding for efficient use of storage space. Plus with support for HDDs of up to 3TB theres more than enough storage for days of surveillance. The 4 Channel NVR Kit comes with a 12 months warranty, brought to you by the leader in electronic devices as well as wholesale NVR kits..